Crystal free and all-natural Ubiquinol 100 mg form of CoQ10 that supports absorption and energy production at the cellular level. NuMedica CoQ-Clear Ubiquinol is a carefully formulated nutritional supplement that is crystal free and includes an all-natural form of CoQ10. The formula is designed to enhance absorption of CoQ10, a substance that occurs naturally in the body. In fact, CoQ10 is found in each of the body's cells and is instrumental for energy production. Associated with a wide array of health benefits, CoQ10 can be taken in supplement form for its various antioxidant protections. NuMedica is a trusted nutritional supplement leader. Its products are renowned for their safety and effectiveness. Coenzyme Q10 or CoQ10 as it is known, is a natural substance that helps your cells produce energy. It is also required for cell growth. While CoQ10 is known to support absorption, it may also reduce the risk of heart disease, reduce blood pressure and cholesterol, and may even help support immune deficiencies. Some research suggests that CoQ10 may help guard against heart failure, diabetes, and even periodontal disease. People who have a CoQ10 deficiency may experience various health conditions that include chest pain and high blood pressure. Obtaining CoQ10 through diet is not always enough to support a deficiency. Taking NuMedica CoQ-Clear can be the optimum solution. While there are many studies associated with CoQ10, many researchers believe that it may help prevent age-related macular degeneration and cataracts. Many people take this supplement to ward off age-related skin problems like wrinkles. Some people find that can reduce the occurrence of migraines and alleviate nerve pain. Studies continue to determine if CoQ10 may be useful for treating other health concerns. 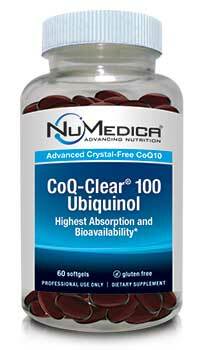 In the body, CoQ10 exists either in its oxidized form, ubiquinone, or in its reduced form, ubiquinol. Ubiquinol is the active form of CoQ10 and may be better absorbed than ubiquinone in some individuals. When oxidized CoQ10 (ubiquinone) is used by the body, it transforms and becomes ubiquinol. In the same way, reduced CoQ10 (ubiquinol) becomes ubiquinone when it carries out its role in the body. Regardless of what form of CoQ10 you take as a supplement, the body is able to convert the consumed form to the other form as needed. In other words, if you take a reduced CoQ10 supplement (ubiquinol), the body can convert the reduced CoQ10 (ubiquinol) to the oxidized CoQ10 (ubiquinone) and vice versa. This conversion takes place to maintain a state of equilibrium between reduced CoQ10 (ubiquinol) and oxidized CoQ10 (ubiquinone). CoQ-Clear 100 mg Ubiquinol (Citrus) - 60 sfgl 1 Softgel 60 Directions: Take one softgel once or twice daily with meals or as directed by your healthcare practitioner. Other Ingredients: Natural food grade citrus oil (GRAS Certified), gelatin (bovine), glycerin, purified water, caprylic acid, capric acid, alpha-lipoic acid, natural softgel color (caramel liquid). †Kaneka QH™ is a trademark of Kaneka Nutrients L.P. Crystal free and all-natural Ubiquinone 100 mg form of CoQ10 that supports absorption and energy production at the cellular level. Crystal free and all-natural Ubiquinone 50 mg form of CoQ10 that supports absorption and energy production at the cellular level. Provides 100 mg of CoQ10 (Ubiquinone) and 5 mg of PQQ delivered in phosphatidylcholine liposomes.